The Annual Lottie Moon Christmas Offering for International Missions goal for 2012 is $175,000,000.00. 100% of the offering goes to support international missions efforts of the Southern Baptist Convention. The 2012 Lottie Moon goal for our church is $1250. Offering envelopes will be available soon. Meanwhile, you can mark your checks or regular offering envelopes “Lottie Moon”. Our Lottie Moon Christmas Offering Goal for 2011 was $1250. As of today (12/19/11) we have collected $1298! Sunday evening, I’ll be presenting my report on my Ukraine Mission Trip! I encourage everyone to attend services and, more importantly, LIVE like you are a child of the Most High God! Invite your family and friends to Sunday School; they’ll be glad you did! 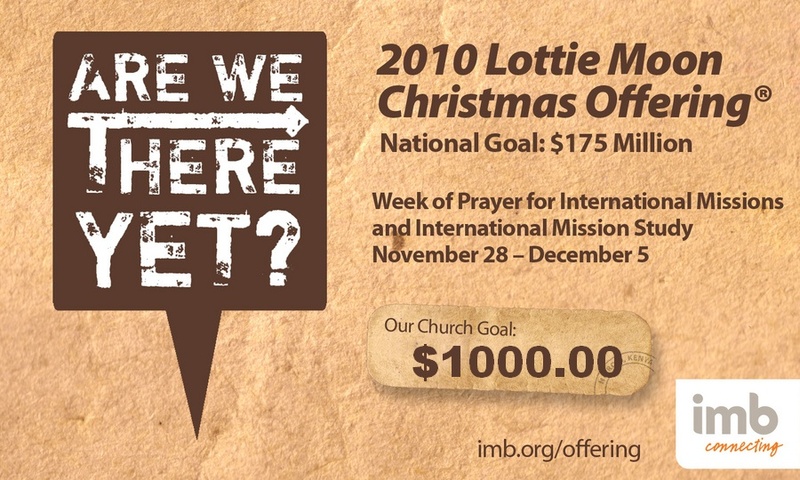 The International Mission Board has announced that the 2010 Lottie Moon Christmas Offering Goal is $175 million! Our church goal is $1000.00. When it comes to reaching a lost world for Christ, some may wonder how far we’ve come and how much farther to go. Today, we can identify the people groups that remain untouched by the Gospel. For the first time, it is conceivable that all people groups can be reached in the coming years with a Gospel presence. According to IMB’s 2009 statistical data* there were 506,019 baptisms, 204,192 churches. Church membership overseas was at 10.7 million, and there were 24,650 new churches. Yes, there is still a long way to go, but progress is being made every day. Now is the time to also take a fresh look at the challenges ahead and be ready to finish the task. With 45,560 churches in the Southern Baptist Convention, there is much work to be done. A little overwhelming isn’t it? he task is doable, but it will take all of us – our churches, our missionaries, our national partners, our Great Commission partners. Are we there yet? Not quite. But we’re on our way. We are back in Palu! After leaving Wagoner at 7am Wednesday morning we arrived at our front door in Palu at 10 pm Friday, Palu time. God intervened for us in amazing ways at the start of our trip as we had a nice ticket agent that did not even mention charging us for a couple of bags that we knew were overweight, even thought he was very strict with a couple right in front of us in line. The remainder of the trip was a little bumpy, but praise the Lord, we have made it home! Mikayla began showing signs of strep throat on our longest flight from Miniapolis to Tokyo, but Melissa came prepared with antibiotics! We had some trouble in Singapore with our tickets being dated incorrectly for our connecting flight and we missed that flight but were able to get on another flight 3 hours later and arrived in Jakarta, Indonesia, with enough time to book a flight and get all our bags checked in. We were not as fortunate with our ticket agent in Jakarta and paid for about 200lbs in overweight bags. (Indonesia airlines only allow one 40lb bag per person, and we had six, 50lb bags! ) We were very tired by the time we got on the plane to Palu and the kids had some panic moments when the kids woke up to find themselves on yet another airplane. However, with the time difference, even though it was 10pm in Palu, the kids were wide awake on Tulsa time of 9am when we arrived at our house in Palu. Melissa and I were ready to collapse, but the kids wanted to go PLAY with their dog! Thanks for your continued prayers as we continue to adjust and rest in the Lord. Mikayla is doing better health wise, but Andrew is now sick. More updates will follow soon, but as of now, we still do not have internet at our house so email and skype will be limited for a few days.